I have a replacement set of 4 1985 Pink barbie Dreamhouse clear 2nd Floor doors, with most tabs intact for attaching to your Dreamhouse. Only one tab missing on one of the doors end. Great for adding to your house. I will ship internationally however I use the GSP eBay has set up. Thanks for looking!! (Colors and decorations may vary. clean up easy for adult hands!). 1 CANOPY ROD BROKE AS I WAS TRYING TO DISASSEMBLE. HAVE FUN AND ENJOY! Barbie DreamHouse Standard. Condition is New. Shipped with USPS Parcel Select Ground. 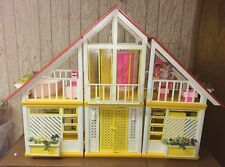 Vintage Barbie Family House (#1066) (1968) by Mattel w/ Original Furniture. This Barbie Dream House (1968) is in pretty good condition, showing appropriate signs of use & wear. Still opens and closes great. Latch works fine. This set includes 2 chairs, a table, a bed, and a couch -- all of which tuck in neatly to the folding Barbie house. I have a nice 1978 Barbie Dreamhouse with most furniture and original box. Box is a little rough and taped together as well as there are a few pieces of furniture and small accessories are missing. This set comes with what you see in the photos. It’s missing the 2 triangle bases, as well as the dining chairs and blanket and pillow for bedding. Some items may need a little cleaning still but I have wiped it down some before packing back in the box. All windows and doors are included and in good shape. This set is still a great collectors item. I will ship internationally however I use the GSP eBay has set up. Thanks for looking!! Living room- chair & couch. Bedroom- dresser, vanity with chair. Kitchen- stove, refrigerator, cabinet. Parts of the house may have been modified to put together - to make level of stay. In bag looks like an outside table & chairs. Pink Recliner style oversized Chair. Light pink in color, no plastic discoloration! Vintage 1977 Barbie Mattel Pink Dream House Furniture Vanity. Condition is Used. The vanity is discolored due to the age. Please look at all the pictures for the condition . Sold as is. If you have any questions or need more pictures please ask. LOT OF 2 1973 BARBIE TOWNHOUSE CHAIRS Color: Orange. Normal aging & wear, other than that, looks good! Right refrigerator door. 2 soda cans (7Up & Dr. Pepper). 5 hamburgers. This Barbie house come with dolls New in box , please look some furniture are in excellent condition. The horse and desk new never play with ahouse is complete with all doors and windows ! ! A lot hours of fun for your little princes . Please look the picture for additional description, this house and some furniture will be send dissemble also will be shipped In 2 or 3 box different, all you can see in the picture is what you will have , come from me free pet and free smoke home please feel free to ask any question ! Great condition for age. Very clean and colors are still vibrant. Original Stickers. Everything included in detailed pictures. Up for sale Vintage Replacement Stove / Oven and Refrigerator frame for Barbie Dream house. In used shape some scuffs and paint wear. Please look at pictures for best idea of conditions. Ask any questions. Thanks for looking. DOES SHOW WEAR. A LITTLE PIECE OF PLASTIC BROKE BUT NOTHING IMPORTANT. CHECK PICTURES. Vtg 1970’s Barbie Dream House A Frame Blue Hutch China Cabinet W Table Base-unfortunately I do not have the top to the blue table, you may be able to find one or make one to fit. The hutch is only missing the top drawer and may need a little cleaning. Great for dioramas or to add to your collection. I will ship internationally however I use the GSP eBay has set up. Thanks for looking!! Two of the covers have splits but there is an extra one so you will only have 1 with a split to complete the section. They have yellowed. I added a picture of the section of the house that these covers are for. All this is very RARE. I try to describe the best I can and give a lot of photos of the item. I have barbie clothing from 1960's to early 1990's listed as I go through my collection. Make sure you check out all photos and zoom in so you are aware of exactly what you are buying. Condition is Used. LAMP AND STOOL. VANITY LIGHTS UP, WORKS, REQUIRES 3 AA BATTERIES, NOT INCLUDED. BED NOT COMPLETE, BUT FUNCTIONAL. HAVE FUN AND ENJOY! Lot of 4 1978 Dreamhouse 1st floor back side French clear doors. These are in good condition considering the age. May need a little wiping down, but over all are in great shape. All tabs intact. Great for replacing pieces on your house. I will ship internationally however I use the GSP eBay has set up. Thanks for looking!! REQUIRES 3 AA BATTERIES, PLAYS MUSIC, FOLDS, CAN BE A BED OR CHAIR. HAVE FUN AND ENJOY! I have a replacement set of 1978 barbie Dreamhouse clear 2nd Floor doors, with all tabs intact for attaching to your Dreamhouse. Great for adding to your house. There might be a little warping to a couple of the windows due to age but still very usable. I will ship internationally however I use the GSP eBay has set up. if you are looking for any single pieces feel free to email me, I could possibly have more pieces. Thanks for looking!! New Barbie Townhouse dreamhouse 2008 & 2009. BARBIE PINK 3-STORY DREAM TOWNHOUSE. Furniture Accessories ,Instructions & Stickers. everything photographed on wood floor. Furniture a ssembly required from printed card board sheets (punch out and fold) with Instruction Book. Also included in this set, a "1962 REPRODUCTION BARBIE DOLL ". Used but great condition. All tabs are present, it has the clothes rod to hang Barbie's clothing up. I have 2 of these closets available. Lot of 8 vertical back side windows. These are approx 5 1/2” tall, belongs to the Side next to the back yellow doors. There are a few flaws but these windows are in very workable condition and not scratched up. I have a replacement set of 4 1985 Pink barbie Dreamhouse clear 1st Floor doors, with all tabs intact for attaching to your Dreamhouse. Great for adding to your house. I will ship internationally however I use the GSP eBay has set up. Thanks for looking!! Faded Blue in color. Tabs are nice and strong,the feet have wear(see pics).